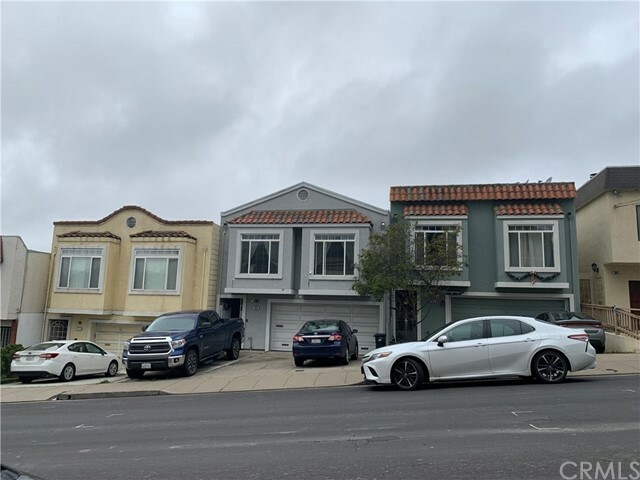 All Daly City homes currently listed for sale in Daly City as of 04/25/2019 are shown below. You can change the search criteria at any time by pressing the 'Change Search' button below. "Serramonte Gem with fully permitted in-law unit! Recently renovated central Daly City home is close to local mall shopping, schools, and Gellert park. Newer kitchen updated with Cherry cabinets, custom title backsplash, and premium S/S appliance package. Also on the main level...contemporary decorated guest bath, 2 guest bedrooms, and the master suite. A spacious family / dining room combo with new hardwood flooring and triple pane windows. The lower level features a separate entrance living unit with full kitchen, full bath, and convenient 1 bedroom and family area. This permitted in-law is great for rental income or extended family living. Storage in existing 2 car garage with new doors and openers. Exterior / Interior just painted. Easy maintenance backyard area with access to a city toddler park. Easy commute with close proximity to local freeways." "This Gorgeous recently updated Tri-Level Home feature 5 Bedrooms, 3 full baths and a 2 car garage. This property has a light and airy main living and dining area with fireplace and a recently updated kitchen and full bath. Upper level features 2 bedrooms and the master suite. Lower level contains 2 additional bedrooms, laundry area and a full bath." "This is it, YOUR NEW HOME! Welcome to this wonderfully updated home with beautiful views of the mountains and San Francisco Bay! Boasting numerous upgrades throughout, this amazing property features a bright and open floor plan, brand new exterior and interior designer paint, new roof, permitted downstairs remodel, brand new laminate wood floors, all new recessed lighting throughout, stylishly remodeled bathrooms, and a truly stunning kitchen with new quartz countertops, modern cabinets, and brand new stainless steel appliances. Whatever your lifestyle, this ideal location and distinctive community lets you create a life uniquely you, and this beautiful modern home will ensure that you and your family live the good life for years to come. WELCOME TO YOUR NEW HOME!" "This lovely 3 bedroom home has been well maintained and well-cared for. There are 3 bedrooms and 2 full bathrooms upstairs. Downstairs has 1 bedroom and 1 full bathroom along with its own kitchen. There are 2 entry points into the downstairs area which makes it convenient for everyone. There is certainly enough room for a growing family in this home. If you're looking for something to do outside of Daly City, you'll have many convenient options. Located only 5 minutes away is San Francisco for all of your weekend activities. 5 miles west is Ocean Beach and SF Zoo. 5 miles north is Noe Valley and Mission District which are filled with amazing restaurants and weekend activities for the family. If you have a flight to catch, SFO International Airport is approximately 10 miles south which borders Millbrae and Burlingame. You will also have easy access to Highway 1, which takes you down the coast through Half Moon Bay all the way to Santa Cruz for a quick weekend getaway." "Custom built in 1955, this lovely 3 bedroom, 2 bath home is situated on an over-sized lot, which can afford the possibility of future expansion of the ability to park over-sized vehicles off street. There is a bonus room and 1/4 bath down (legality unknown). The garage level has ample storage, laundry area and can still park 2 cars side-by-side. Two doors from there open out to a lush yard and covered patio for entertaining. Great bones on this one, just needs some updating and TLC." "Perched atop Crocker Amazon in Daly City's coveted Southern Hills neighborhood, 225 Baltimore Way offers tremendous panoramic views of Downtown San Francisco. The home's wide open and light filled interior spaces have been remodeled to perfection, offering a large Living Room with wood-burning fireplace and separate Dining Room that is open the remodeled Kitchen - boasting gorgeous quartz counter tops, new tile backslash and brand new appliances. The remodeled bathroom offers contemporary and classic design cues with chic subway tiling and separate tub & shower. Two large Bedrooms on the upper level contain graciously sized closets. Downstairs, a large Bonus Room with wet bar and 1/2 Bathroom has endless possibilities for use. A massive 2 car garage and workshop and spacious yard round out this idyllic property." "Location! Location! Location! Walk to Bart, restaurants, shops on Westlake Shopping Center, close to schools, church, and movie theatre, easy freeway access. Needs TLC, 2 bedrooms upstairs with 1 bath, has wood burning fireplace in the family room. Downstairs has unwarranted 1 bedroom 1 bath, has one car garage. This house has lots of potential, ready for your own touch, bring your tools and reap the rewards!" "This Argyll Plan is one of the most desireable floor plans at Crown Colony with a generous 1065 sq ft of living space. A beautiful corner end unit with 2 master suites divided by an expansive living & dining combo, spacious private deck off living room perfect for lounging or entertaining guests. Interior is freshly painted with elegant crown molding throughout. A renovated kitchen with granite counters, maple cabinets, modern stainless steel appliances & a built-in wine rack makes for great cooking. Each bedroom has its own private bath and double closets for the wardrobe enthusiasts. Broker's Tour- April 23 1-3 PM."